Ted Lombardi, Principal of Malden High School recently announced that Malden High School has been awarded a "Learn and Earn" Grant by the Massachusetts Clean Energy Center for academic year 2017-2018. MHS was the recipient of this grant for the 2016-2017 year as well. Twenty students completed an application process to become part of the “Learn and Earn” program where they complete more than 80 additional hours of classwork to learn about how to create career paths, write resumes and learn interview skills. They also learn important lessons about dependability and professionalism in the workplace. The Signal Success curriculum (designed to teach young people essential skills for future success) from Commonwealth Corporation guides their learning in this area. Students also explore clean energy jobs and receive enhanced learning and classwork in environmental science, circuitry, clean energy generation, and construction. As the culminating project for the 2016-17 schoolyear grant, students are in the process of building a clean and energy efficient “Tiny House.” Students work 25 hours each week and are paid $11 per hour for their labor. The building will serve as a model to teach them about green construction, efficiency, clean energy use and generation, solar energy, and smart technology. 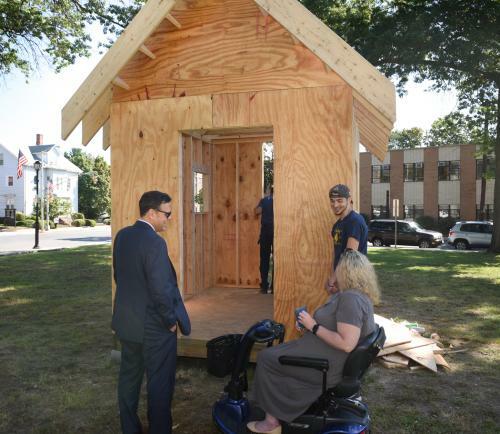 The construction and planning for the energy efficient Tiny House began in the “Maker Space” at Malden High School with modular parts, and has now been moved onto the grounds of Malden High School. The Maker Space at Malden High School houses technologies like 3D printers, robotics, microcontrollers and electronics, a fully-functioning wood-shop, and the resources to build and experiment with planning and construction. By the end of the summer 2017, the basic construction of the tiny house will be complete, with a number of clean energy components actively running. Participating youth have also engaged in worksite visits, learning and experiential projects and training with the City of Malden Building Department, Tufts University, and Solar City. Students also have the opportunity to earn pre-apprenticeship hours through their work on the Tiny House through an agreement with the Division of Apprentice Standards. The Massachusetts Clean Energy Center is a publicly funded agency dedicated to accelerating the success of clean energy technology, companies and projects in the Commonwealth- while creating high quality jobs and long-term economic growth for the people of Massachusetts. Since it began operating in 2009, Mass CEC has helped clean energy companies grow, supported municipal clean energy projects and invested in residential and commercial renewable energy installation, creating a robust marketplace for innovative clean technology companies and service providers.